NASA solicits new studies on the current solar minimum | Watts Up With That? are due June 5, 2009. gSolicitationsh then gOpen Solicitationsh then gNNH09ZDA001Nh). This is a three year project with funding of 1.5 million dollars per year and total funding of 4.5 million dollars over the life of the project. This is a very good insurance and CYA policy on NASA’s part. They may get some interesting research out of the project and if conditions on the Sun take an unexpected turn, they can always say: “Yes Senator, NASA was right of top of the situation and we funded this new project on 3/5/2009”! 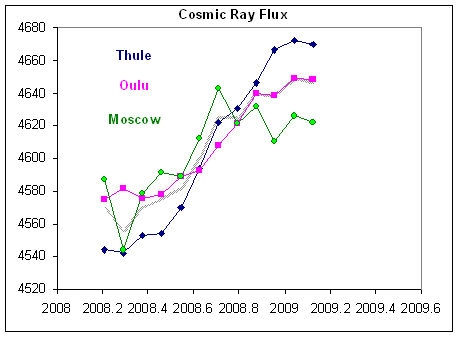 Cosmic rays at near record-high levels. Remarkably persistent recurrent geomagnetic activity. Thus, we have an unprecedented opportunity to characterize the quiet/background state of the heliosphere when the solar source function is as close to the ground state as it has been in the modern era. NASA’s Heliophysics Division wishes to facilitate study of this special period. This ROSES element thus solicits proposals to study the Causes and Consequences of the Minimum of Solar Cycle 23 (CCMSC). Proposals are encouraged that take advantage of this opportunity with studies of domains ranging from the center of the Sun through terrestrial and planetary space environments to the boundary of the heliosphere. High priority will be given to studies addressing the interaction between various regimes. Taking maximum advantage of this opportunity will require interaction between specialists in different regimes. Selected Principal Investigators will have responsibilities for both their own specific research and for participation in a yearly workshop where all the CCMSC investigators will be brought together to explore the implications of their own work for other regions. Proposals should address both of these responsibilities. March 12, 2009 in Science, Solar. CYA policy? Cover Your A$$? 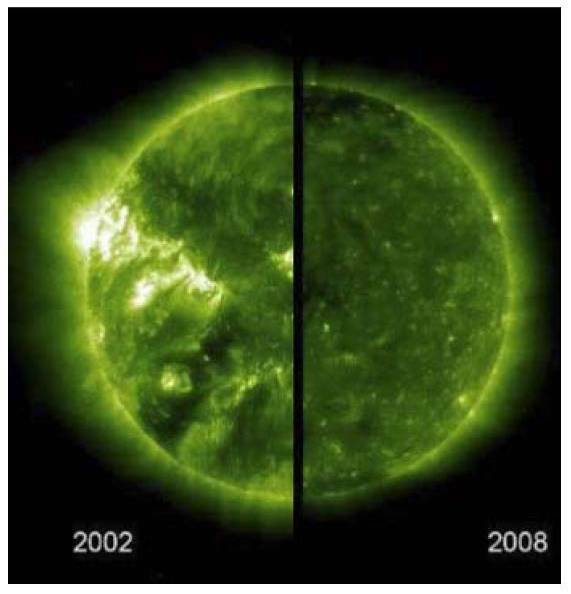 I thought the science was settled, the Sun does not affect of influence climate, only the Co2 released when we drive our SUV and other fossil fuled lifestyle choices. It’s a good thing their acting so quickly, this minimum’s not getting any younger. I am relatively new to all of this (several months now). However, it seems absolutely extraordinary that NASA is just now recognizing publicly that the sun seems to be defying predictions. I wonder what Hansen’s take on this is. Oh bless their poor little hearts. I see the pdf links still show the document giving the study as solar cycle 24 minimum. You would think that by now they’d have corrected their correction. An excellent opportunity for a career change for a certain Mr J Hansen. The description of the specific proposal opportunity on this page is contained in the document ‘B.9 Causes and Consequences of the Minimum of Solar Cycle 24.’ This document is kept up to date and incorporates amendments in a clearly identifiable manner. ROSES-2009 is an omnibus NASA Research Announcement. It contains over 50 different proposal opportunities. In the “Announcement Documents” section above, the document ‘Summary of Solicitation’ describes the common requirements for all ROSES-2009 proposal opportunities; all proposers must satisfy the proposal requirements in the ‘Summary of Solicitation’. The documents ‘Table 2’ and ‘Table 3’ contain the list of all proposal opportunities and their due dates. The document ‘B.1 Heliophysics Overview’ describes research activities within the NASA science division that is managing the specific proposal opportunity on this page. The document ‘B.9 Causes and Consequences of the Minimum of Solar Cycle 24’ describes the specific proposal opportunity on this page. All of these documents are kept up to date and incorporate amendments in a clearly identifiable manner. I don’t think Dr. Svaalgard may want to involve himself just yet. It’s still the same weird stuff covered in your earlier post abiut the end of Cycle 24. Someone at NASA is joking maybe? Partially OT… Did we see solar flux dip below 69 this weeK? Meanwhile….during all of this confusion….one of the NASA leaders….even though other emergencies such as the sun, warrant dire concern…he takes the time to become a civil activist and do his Youtube AGW/snowbound protest thing. Nasa is a pretty big organization. At least the solar sciences division seems interested in advancing our knowledge of the sun-earth environment. Even Hathaway has acknowleged that the current solar minimum is going to ferret out and dispense with various solar cylce theories. (Hopefully he is including his own). What does in the “Causes – Solar output. . . Cosmic rays at near record-high levels” mean? I must have missed the discussions on near record-high level cosmic rays. Scientific theories are well tested explanations of natural phenomena. When it comes to solar cycles, there ain’t one. 1) Causes – A dearth of sunspots. A) A booming market for snow shovels and “woollies”. B) Class action “windmill ice projectiles destroyed my home” lawsuits. C) Class action “clouds starved my solar farm” lawsuits. D) Announcement by NASA that their global warming computers predicted a “mini-ice age” would immediately precede the “smoking ruin” phase of AGW. E) Nobel Committee demands return of their Prize. F) NOAA announces the freezing point of water has risen to 50 degrees F.
G) N.Y. Times reports that noodling the aardvarks has buggered the jim-jams. Of course I will be applying for a grant. I might as well get paid for something I have been doing for free. My biggest qualification is that I have no formal training in the field. That reminds me of a letter to the editor of the local newspaper complaining that I am not a climate scientist. In my reply, I said “From my telephone conversation with Mr Crisp, I understand that he is a doctor. I am not a doctor, and have no medical training whatsoever, but I am the inventor of a patent on a cancer drug that has successfully completed in vitro trials at Queensland University, with a recommendation from the professors involved to proceed to human trials. We are not limited by our qualifications, but only by our imaginations. Unfortunately I have been distracted from cancer research somewhat by the immediate threat to Western Civilisation from the global warming zealots.” I am still time short, but when NASA makes a cry for help, how could we fail to respond? It would be heartless to stand idly by while they have made plain their need for fresh thinking from outside the same old stale solar physics community. The only people standing tall now are the wavelet people like Clilverd (who I will engage as a subcontractor) who predicted a small Solar Cycle 24 well in advance. My contribution was to say that if 24 is going to be small, then 23 is going to be long, and the first sign of a small 24 will be a long 23. It has come to pass, almost 13 years now. I am less tentative on the F 10.7 flux. If it hits 68, then the minimum definitely is not in yet. This is the closest I’ve seen to NASA suggesting maybe they don’t have a handle on everything. That in itself is interesting… I’d like to see NOAA, who understands everything, do the same. Well, personally I’ve heard many people say there is nothing unusual about this minimum, but obviously there is. Maybe knowing the causes is still a long way off, but I am concerned about the consequences. Do solar funks lead to climate cooling? I honestly hope not! Weren’t we supposed to be having record melt and sunbathing polar bears? They dont make it easy do they….I got totally lost myself. After all, he is qualified in astrophysics not climatology. Does this mean that NASA is acknowledging the correlation of low solar activity with high cosmic ray levels? Reverence for NASA by it’s tax payer owners does not seem to be very strong characteristic of this forum! David: The flux ‘broke over’ on approx. Feb 15th. Heading down at 1 flux unit per month. If it doesn’t stop doing that, it’s light’s out for minimum. The sun, like a good Leapord, can’t change it’s spots. That’s my contribution: Terrestrial Perihelion does not coincide with max flux. Do solar funks lead to climate cooling? I honestly hope not! 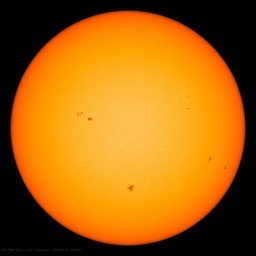 According to solar measurements and proxies matching up with literature from selected times, yes, they certainly do. They are not all created equal, though. Some are quite momentary and do other equally rough things to climate. Like generate dust bowls. We are in this thing deep enough right now to feel the power, no matter what else happens. NASA’s problem, along with a select few other agencies, has found itself in bed with the wrong idealogy. They don’t need another 3 years to study this, just follow what Eddy investigated and read the literary works. It’s there. As I have said before, many years ago (30+) the BBC (when it was a great publicly funded & INDEPENDENT broadcaster) prodiced a “Horizon” programme (When it too was a great prgoramme) about sunspots. They highlighted how patterns could be drawn from sunspot activity & correlated with historical events, the rise & fall of Hilter, the rise & fall of Beatlemania, even the rise & fall of dress lengths, etc!!!!! This is to name a few recent events, & yes it all may be completely coincidental as always. I wonder though if in many years from now, a pattern will be observed in the rise of greenism, its radical fanaticism peaking in 1998, to a steady yet whimpering decline in the early part of this century, as cooler times prevail? I still have that sneaky suspicion that mankind is not completely aloof to such influences, were they to exist. Please, don’t think I’m a voodoo addict or anything like that, far from it, but I wouldn’t place any bets just yet! As I understand the humble bee relies upon the sun for navigation, how do we really know we are not influenced by it in some weird way? Oh well time will tell. It will be interesting yo see the names of those actually granted money for this research. My guess is that there will be several proposals from AGW believers and skeptics alike; so how will NASA choose? I always smile when I think about NASA’s “What’s Wrong with the Sun? (Nothing)” headline from July 11, 2008. Just watched the world temperatures forecast on SBS (Australia) tonight, and still the NH looks so very very cold. Chicago -14c, not f, c!!!! That’s cold! Catastrophic global warming must be on holiday (On the Sun). Perhaps Svensmark could tap into this funding to support his research into impacts on earth’s climate. BTW, has anyone seen any data on changes to lower atmosphere cloud cover levels in the last 2 years? Well, they can at least fund one Professor and a few postdocs for 3 years on that. Not exactly ‘balancing up the research streams’, but it’s a move in the right direction. Late in the sunspot cycle, the leading spots diffuse across the equator and cancel with the opposite polarity leading spots in the other hemisphere Due to the Coriolis force during the flux tube emergence, the sunspot pairs are tilted to the E-W direction The flux of the trailing spots and of the remaining sunspot pairs is carried toward the poles where it accumulates to form the poloidal field of the next solar cycle. This hypothesis is basis of the NASA’s current understanding. I suggest a detailed re-examination of this hypothesis is required, before any progress can be made in the understanding not only of this one, but other major (Maunder, Dalton, and possibly new one due around 2025) minima. It means that the Solar winds are now pushing less of the Cosmic rays back into outer space, causing more Cosmic rays to hit Earth’s atmosphere, causing more clouds to build up (according to Svensmark’s theory) and possibly causing the Global temperature to drop. CYA policy? Cover Your A$$? I thought the science was settled, the Sun does not affect of influence climate, only the Co2 released when we drive our SUV and other fossil fuled [sic] lifestyle choices. Oh calm down. I saw nothing in the release about studying climate, only the Sun and first order related effects (e.g. cold contracted ionosphere). This isn’t a request from NASA’s GISS, it’s from NASA’s Heliophysics Division. I won’t hazard a guess as how they would consider a proposal take advantage of this unique opportunity to look for climate effects related to this remarkable minimum. LOL I am just a layman, not in any way associated with the study of space or the sun, and even I could see a year ago that there was something unusual about this cycle. Beautiful graphic! May not mean anything but certainly communicates. We’ll see. The only career change I think would be appropriate would for NASA to hand him his pink slip. On this article…. Its great that NASA (after presumably MONTHS of endless and tireless research and analysis /sarc off) have established the Sun may be behaving a little unusually perhaps significantly so (time and analysis will tell) and are going to devote some research time to look at it closer. I genuinely look forward to their findings. Note no formal training in this, but that just seems to me to be a little bit of an issue. Are the numbers in the sidebar (from http://n0nbh.com ) adjusted for distance? I have a slightly off-topic question about the flux for David, Lief, or anyone else who has an answer – is the strength of flux measured at Earth impacted by the amount of “space dust” (particles of whatever) between the Sun and the Earth? If so, is that taken into account in the adjustment that’s applied for Earth/Sun distance? Just watched the world temperatures forecast on SBS (Australia) tonight, and still the NH looks so very very cold. Chicago -14c, not f, c!!!! That’s cold! Either way is cold, but F!!! not C is colder. Just teasin’ you metric users…. ha! last F10.7 I saw adjusted for 1AU was 66.0. I also have noticed the Ap index tending to be under 2 for a while, a few days ago it made it down to 0.385. Kudos to NASA, I think this will be money well spent. After careful analysis we have determined that the current lack of sunspots is a direct result of a global warming byproduct here on Earth. This lack of activity has been predicted by both Hanson and Gore hence it will now be called from this time forward. The Hanson-Gore Effect. Of course, none of this could have any impact on global temperatures. None. sry. I ‘d when I shoulda ‘d. Why stop at the boundary of the heliosphere? We have been mapping “temperature” variations in galactic neutral hydrogen outside of the heliosphere since the 70’s. Surely changes in the number, temperature, and electrical charge of particles streaming into the heliosphere through the solar apex have some impact on the interior? Or is that too simple? They couldn’t possibly believe that the heliosphere is a closed system, right? Or are those dumb questions? this is the point to the research . It is WAY over our heads people. Dr. Hathoway is tossing in the towel!!!! you see any new predictions? WELL this explains my confusion, you see the short cycles work, instead of a long cycle. this changes everything…. get it? Anna V? you see this too? anyone want to ponder this????????? Instead of sending a telescope to try to find earth-like planets, maybe they should send 3 telescopes to study the sunspot/solar activity/cycles of 1) a young star, 2) a sun-like star and 3) an old star. That could be a good proposal that could span 50 years of research and financing. The Hansen-Gore Effect is as advertised: A Snowjob. They must have hired a 1,000 writers to come up with everything under the Sun is caused by C02. All you got to do to get a piece of the pie is to imagine something that is caused by C02 increase. $$$ is waiting for you. I have one: C02 increase is causing mass hysteria, countered only by the increased cold. Accept the truth, deniers! CO2 is a magical gas species which exhibits properties “in the wild” that no one has been able to coax it into exhibiting in a laboratory. The science is settled! Science = magic. Seriously, though, I just realized that I made a technical mistake in my first post. “through the solar apex” should have more correctly been stated “from the point on the heliopause where STEREO mapped double asymmetrical Hydrogen ENA peaks shortly after being commissioned”. Which just happens to be in the same direction as solar apex. My mistake. Am I the only one who finds this latest “He I 10830 Å spectroheliogram” from the U.S. National Solar Observatory at Kitt Peak (Arizona)” strange? I know it is only symantics, but I would like to get everyone on the same page. On the Hannity Global Warming Watch thread, we have been calling this the Gore-Hansen minimum for some time, yet here it seems to be the Hansen-Gore effect. I would hate for the AGW guys to find a way to get us divided because of a matter of who gets top billing. I got it. A sure-fire winning project that will definitely get approval from NASA. Say you have a theoretical link between the solar minimum and “climate change”. You will definitely get funded then! Robert, the solar flux will be 65 in June. Still flatlining. David: What do you make of the lagtime of 6 weeks +-1 ? I see it hazily in the 2008 data. I’ll have to run a graphing program on the Flux for the uncorrected, corrected and 0.9x values. Any reccomendations on graphing software that is public domain and runs on Windows? I’m using a trial version of Findgraph right now. Did we see solar flux dip below 69 this week? 2454904.322 2081.162 2009 03 13 2000 0068.2 0067.4 0060.7 2 As you can see here: http://www.leif.org/research/TSI-SORCE-2008-now.png the Sun has started is slow climb into cycle 24, if ever so slightly. Babcock-Leighton solar dynamo hypothesis goes something like this: […] This hypothesis is basis of the NASA’s current understanding. I suggest a detailed re-examination of this hypothesis is required. Why is that required? The B-L dynamo is the very basis for our prediction of SC24 being the lowest cycle in a 100 years, and the Sun seems well on its way to a low cycle. Say you have a theoretical link between the solar minimum and “climate change”. You will definitely get funded then! Whatever you think of climatology, it could be worse. Atlantis, Mayan calendar, 2012, Revelations, and much much more. He says the last ice age ended because a wave of cosmic dust caused a T Tauri type flare up of the sun. Reading this is much more fun than reading the mainstream climate apocalypse news. I know many have jokingly referred to this as the “Gore Minimum” (and where’s the fun if it goes over his inflated head? ), but I thought it has been officially named for Theodor Landscheidt. Or am I mistaken? maybe i am in a parallel universe ? Robert, the solar flux will look after itself for a while. What I am doing now is preparing for Solar Cycle 23’s birthday. It will be 13 years old next month – a teenager!. Thirteen is a coming of age that is celebrated by a number of cultures. Very few humans get to experience a solar cycle this long. The last time was over 200 years ago. We live in a special time with our special solar cycle. Dr Svalgaard keeps saying that GCRs have peaked out, and I keep going back to Oulu and find that the neutron count is still in uptrend. Oh well, wishing can’t change hard data. “Oh calm down. I saw nothing in the release about studying climate, only the Sun and first order related effects (e.g. cold contracted ionosphere). This isn’t a request from NASA’s GISS, it’s from NASA’s Heliophysics Division. I was being sarcastic and stressing NASA’s CYA policy. I thought it was rather funny in the age when the “science is settled”. I stand corrected however, shouldn’t you join the the 17th century like the other metric users? One should be careful about referring to a solar minimum and mentioning Gore in the same breath – next thing you know he’ll be saying he “discovered” it. Well, space weather is showing a new spot emerging in the Southern Hemisphere but haven’t numbered it or announced its parentage yet. Another Cycle 23? In the current WUWT post about the Scafetta-Wilson Paper there is a graph which makes your TSI appear to be at 1365.6.
your TSI appear to be at 1365.6. Because there are systematic differences between the various spacecrafts of the order of 5 W/m2. It is very difficult to get the absolute value correct so people simply move the scale up and down a bit when comparing data. The relative variation [and that is what matters here] is much more accurate, so the TSI from two spacecraft will show the same ‘wiggles’. …….The B-L dynamo is the very basis for our prediction of SC24 being the lowest cycle in a 100 years, and the Sun seems well on its way to a low cycle. Babcock-Leighton solar dynamo hypothesis contains in its definition number of contradictions, physics’ and statistically questionable, too dependent on chance (as you are well aware), and extremely unlikely to produce response of a regular form as recently measured. As it can be seen it has a considerable area asymmetry (and if you throw in a double dynamo, with two operating independently) , while the current two polar fields “formed independently” from SC23 have no significant asymmetry whatsoever; a major statistical miracle. There are numerous other problems with B-L , not to mention getting out of the Maunder and Dalton minima, cycles 19-20, etc. I do not particularly dispute fact that polar fields may be seed for the next cycle and possibility that can be used as a loose indicator of what may follow. However, as far as predictions are concerned, predictions are just that and no more. Svalgaard / Cliver prediction formula goes back only 3 cycles, statistically too low sample to be significant. As a matter of interest Vukcevic combined formula which has a good past record (16 out of 19 cycles) predicts peak of 78 (smoothed 70 or less) sometime in 2013 or lower in 2014. You may dispute its value, but it has at least 200 year 19 cycles record, with 85% success rate, far more meaningful then just 3 cycles with 100% record, but I do not dispute Svalgaard / Cliver record, it is the other way around, and bear in mind that the current solar science and knowledge are not absolute. I thought we had gotten rid off you, that you had taken your ball and went home. You have predicted nothing. The curve fitting with a small number of parameters is numerology. There is no basis in physics. The B-L dynamo is alive and well and has no problems or contradictions. The randomness is a significant and important element, just as in predicting the weather. Anybody should be suspicious of a formula purporting to predict that there will be a tornado in Houston at 1:32 pm on May 11th, 2087. Anybody should be suspicious of a formula purporting to predict that there will be a tornado in Houston at 1:32 pm on May 11th, 2087. Darn! I forgot to take Pluto into account. On the matter I won the argument (the correlation of the Vukcevic formula being excellent), condition was you produce alternative, after some parabolic, shall I call it a ‘joke’, my formula appears to have been mutilated, presented as something new. The agreement was to tell us how you done it, you never did, so according to the Queensberry rules, you lost the argument, so I shall not discuss any further ‘the unquestionable correlation excellence of Vukcevic formula. I am never afraid of loosing an argument, if I have to, otherwise what is point of arguing the subject. As far as Pluto is concerned, I should not take names of the ancient gods in jest, I was born and grew up not too many miles away, and I can tell you, their rage is absolutely fatal to us mere mortals. my ranting is not about barycentre, it is on electro-magnetic lines, your blog is top, and I owe to it ‘my solar science circles infamy, and I am particularly proud to be known as ‘an illiterate of superior ignorance’ in his vane attempt to shake out giants of the solar science. Thanks again giving me, and likes, opportunity which I hope not to abuse. Perhaps you missed it. I simply said that the observed polar fields had a 20.4 year period and that there is a long-term amplitude variation of solar activity and hence also of the polar fields. The period I used [104 years] is just the one matching the observations, the rest is standard math to match the observations. The point was just to show that it is easy to produce excellent fits to existing data, but such a fit does not guarantee a match outside of the domain used in the fit, hence that the mere existence of an excellent correlation cannot be used as a predictive tool unless it is based on solid physics [which, BTW, yours is as I have shown repeatedly]. And while we are on explanation where things come from: where does the pi/3 phase in your formula come from? Let us see if the Queensberry rules can be used to ferret out that nugget. To be proud of ignorance is a bad thing. hence that the mere existence of an excellent correlation cannot be used as a predictive tool unless it is based on solid physics [which, BTW, yours is notas I have shown repeatedly]. I missed a NOT there. Pi/3 is an acronym for a long number 1.04719755119660, but as you will realise does not make much difference. That particular match is over, if you loose can’t blame the ref. The ordinary everyday’s ignorance yes, bad; but ‘superior ignorance’ is an exceptional quality. when ‘superior ignorance’ comes down to not knowing the difference between -114.112 [which is your value for 2004 with pi/3 phase] and -1.051 [which is your value for 2004 without the pi/3] then the ‘exceptional quality’ has faded considerably. was a remark directed to Dr. Svalgaard, the scientist who did nor consider this ‘science’. Do I conclude, with considerably anxiety, that you may be coming round to this magnetospheric ‘astrology’ lark, since I do not desire intruders, even less a serious competition in my protectorate. My dinner is getting cold. Dosvidaniya. you posting is just gobbledygook, perhaps it is time to refrain from similar mutterings in the future, if you want to be taken seriously. you posting was just gobbledygook. You have a question to answer: where does the pi/3 come from? It will suffice to say that it is just fiddling to make it fit the observations, like my choice of 104 years for the long-term period in solar activity. Vukcevic is certainly right about the outdated Babcock-Leighton theory. Imagine a theory that can predict a massive SC24 as per Dikpati and Hathaway, down to a low to medium cycle as Svalgaard predicts. With its different fudge factors built into the conveyor belt speed, to the ridiculous five tongued approach for loading the solar poles near the end of a cycle…pick a tongue, any tongue. No wonder NASA is looking at other methods. Reply: Thank you. ~dbstealey, mod. Imagine a theory that can predict a massive SC24 as per Dikpati and Hathaway, down to a low to medium cycle as Svalgaard predicts. That is the strength of the theory, that is covers it all. The different predictions come about because of different boundary conditions, like a weather forecast being different if you feed in different observations. the ridiculous five tongued approach for loading the solar poles near the end of a cycle…pick a tongue, any tongue. No wonder NASA is looking at other methods. Reply: Be respectful, please. Thank you. ~dbstealey, mod. “I thought we had gotten rid off you, that you had taken your ball and went home. QUALIFICATION: I RESPECT DR. SVALGAARD…but it would be greatly appreciated that HE be held to the same standards as other serious contributors on this site. While agreeing with you in principle, on this occasion the moderator snipped the end of my comment because I was commenting on Anthony’s Reply. I dont think he meant that my comments about the Babcock-Leighton theory were out of line. Geoff Sharp: No wonder NASA is looking at other methods. Dr. Svalgaard: They are not. Perhaps, Dr. S., you may have not seen the subject of this thread. But I am sure you have. In light of the following, how can you claim: “They are not.”? But I am sure you have. In light of the following, how can you claim: “They are not.”? Because they aren’t. They are not looking at other models for the solar dynamo because the B-L dynamo has been abandoned or is in disrepute or anything like that. Within the framework of the B-L paradigm there is enough room for variation to encompass everything we have seen so far, including Grand minima. The specific topic at hand is the current minimum and in particular its consequences. How do i know? Because this is my field of specialty and I know what goes on both in front of and behind the curtain. this site is slipping into totalitarian non-thinking at times (I know that sounds strong but). We are all intelligent enough to challenge ourselves and to be humble enough to be open minded. I’m tired of Leif’s attempt to silence the other voices on this blog in a rude manner. This site appears as an open forum and with the number of lies it has revealed from various sources it needs to be, however dismissive tactics are being used without proper study from Leif who is more than capable of such. This is leading to a new set of believers, the Svaalgard’s, who are largely taking it on trust that he is right. This is dangerous to the very cause this site so well achieves. It is clear to anyone who looks at the all the evidence properly that he isn’t the sole holder of truth. Real science never stops asking questions, you have provided many articles which show us all a chink of an insight that there is lots we don’t know. It is only through debate that we learn, speculation being an essential part. Leif acts like he is already complete. I think a lot of people will be intimidated by his approach and their valuable contribution is silenced. This is a travesty and if it continues will be to the detriment of the brilliant potential of this site. (Sorry to be so serious but I have sat well back partly because of the lack of gentlemanly conduct here which quieted my input especially from Leif and nothing is changing and yet the questions still need to be asked). Well, I think I have studied these ideas much more than they would have been considered by other scientists, but, hey, if the poster’s opinion is the prevailing attitude, I’ll be happy to call it a day [as I did in similar circumstances at Tamino’s]. Leif, you know what I mean. This does not have to involve you going anywhere. No. I do not know what you mean. Science is cruel and unforgiving. There is no room for an ‘open mind’. Ideas have to fit in the established framework for science to be able to build upon previous research. The few that don’t and are revolutionary are far between and I have not seen any here. Ideas should not violate physical law. If they do, they are as much nonsense as perpetuum mobiles. Wiggle matching is usually bad science, etc, etc. And IMHO opinion, it is not rude to characterize such things as nonsense, pseudo-science, etc. It is an obligation for a scientist to do so. The danger in that is that one often gets sullied by doing so. Leif, so every article that appears on here that challenges what you have said, and there have been many, are totally wrong in your opinion? I would agree with what you said its just that I have read many other highly reputable and very bright scientists who disagree with you. They mostly have no voice on here. From Soon to Corbyn, Sharp and Monckton, Bellamy, Archibald, Maunder the list is endless. The one thing that remains the same is your rebuttal of all of them. That’s why this doesn’t add up. I have read them and their proof is clear. The fact you can’t see any of it and yet hold such a high position is what smells fishy and is so frustrating. “There is no room for an ‘open mind’.” WHA???? Stop being so emotional, Lief. Why drag emotions into this? The science IS WHAT IT IS. Res ipsa loquiter. I get that. We ALL get that. I KNOW you get that because you infer it all the time….and I AGREE. And even though good science defends itself, I certainly appreciate your deep-felt need to defend it as well. But to say there “is no room for an open mind” is about as contradictory a statement that I should ever expect coming from one of the world’s leading solar physicists. If you spent less time emotionally addressing everyone who calls something you say, and STICKING TO THE DATA AND THE GREAT RESEARCH YOU HAVE WORKED YOUR WHOLE LIFE ON, then we would all be a lot better for it. Thanks for your contributions….they are MUCH appreciated. But lighten up. By the way, Edward…would love to hear your contributions and please chime in to the following if you would like. Is the current climate at NASA such that HELIOPHYSICS have taken a back seat due to the Gore-Hansen rudder? What i mean by the “rudder” is that my hunch is they have steered most scientific research at NASA? Anyone care to comment if Heliophysics have been-burnered at NASA, and now they are trying to play catch-up? I would agree with what you said its just that I have read many other highly reputable and very bright scientists who disagree with you. Disagreement is the life blood of science. Feel-good agreement [‘you are on the right track’, ‘keep it up’, etc] is not. You left out my quotes as in ‘open mind’. What one should let into one’s mind is not everything whatsoever. Stuff has be vetted and weighed. Some people can do this, others cannot [no shame in not being able to do something – I cannot sing or run 100m in 10 seconds]. As to if I’m emotional… Who types in CAPITAL LETTERS here with multiple?????? I’m about as unemotional as they come. I try to explain things the best I can, not to argument for the sake of such. You are free to ignore my explanation as you see fit. It will be interesting to see if we can turn the focus of this discussion back to the science. I would be curious to know what Dr. Svalgaard believes might be responsible for the 7.8 year signal detected in European temperature time series by researchers at the Academy of Sciences of the Czech Republic – Geophysical Institute. Leif, my open mind sense (meaning) is different to yours your arguing with something I didn’t say think or mean. However, I give up. Not once have you agreed with any part of what I and others have said. And you will obviously continue. This is not a worthwhile exchange. You should challenge your scientific assumptions, re-evaluate even if you think and especially if you don’t think you need to. Anyone care to comment if Heliophysics have been back-burnered at NASA, and now they are trying to play catch-up? They got a poor report card: http://sun.stanford.edu/~todd/NAS.Heliophysics.pdf and are trying to show that they are doing something. So it seems all we are left with is “Ideas should not violate physical law”. This is trotted out because there is nothing else left to criticize. How can we presume to know everything about all physical laws. If we are talking about Planetary Influence, angular momentum and tides ARE part of the physical laws involved and are not violated. Even in a paper trying to discredit any theory other than the Babcock-Leighton model DeJager does the calculation and accepts this. The forces involved might be small (I would like to see the calc detail) but they certainly don’t go against physical laws. DeJager’s paper here for those wanting to check it out. Is the current climate at NASA such that HELIOPHYSICS have taken a back seat due to the Gore-Hansen rudder? What i mean by the “rudder” is that my hunch is they have steered most scientific research at NASA towards AGW research because that is the subject du jour….so in effect solar research has been back-burnered? Maybe that why they got a poor report card because not enough $$$ or resources or manpower to study it? Certainly Goddard Director James Hansen can’t help them out. He is too busy standing in front coal power plants. To quote the quote that someone else circulated on here: WHERE IS THE NASA THAT PUT PEOPLE ON THE MOON??? Your specific mechanism by which the change in angular momentum would influence solar activity by changing solar rotation is the part that is violating physical law. Tides and orbital accelerations are not, but are as DeJager points out woefully inadequate by several orders of magnitude. I don’t think so. I wish it were, as that might reverse soon, but alas, I think just plain incompetence. So orbital accelerations/decelerations of the Sun don’t have an effect on the Sun’s rotation rate? That is correct. There is no couple between the two strong enough [as DeJager points out] to accomplish that. So now the argument is that angular momentum theory does not violate the laws of physics, but the change in acceleration caused by angular momentum is not enough to change the rotation speed of the Sun? No, that is a distortion. Without a couple between them, orbital angular momentum cannot change rotational momentum and there is no couple, and even if there were a coupling, it would be too small. Violation comes in by positing that if a body in orbit about another body slows down by changing its distance [e.g. in an eccentric orbit], the other body will rotate faster. Okay, I’m done with this barycentriscm. The thread is about the solar minimum and NASA soliciting papers on it. Geoff Sharp, please stop turning threads here into arguments about barycentrism. This discussion is completely relevant to the NASA topic and I have been responding to Svalgaards questions and statements. The Babcock model is failing and NASA are badly in need of some insight, I am intending to lodge my interest with NASA. Effectively you are banning discussions on Planetary Influence. I suggest you create a separate story stating this fact so everyone will know. This site HAD the opportunity of being in the forefront of an emerging area of science that will most likely be proved in the near future with the onset of a grand minimium. Future discussions and discoveries for those interested will continue on solarcycle24. Although the model presented in the paper is not physics-based, it seems the authors were quite thorough in piecing together clues about past temporal patterns. If I were teaching a course, I might put this paper on the reading list for its educational value (regardless of what I thought of the methods & predictions). Although the model presented in the paper is not physics-based, it seems the authors were quite thorough in piecing together clues about past temporal patterns. The paper uses sunspot numbers that likely are too low in the 18th and 19th centuries so the cycles come out not quite right. The two dominant periods are 11 and 106 years, all the rest could be noise as they don’t contribute much. Overall, the two papers are very speculative, but speculation is an honorable thing so there is value in the papers. If not for other reasons, then for bringing forth the issue of long-term changes in the system. The details are most likely wrong, but the issues stand. The very low SC24 prediction [43+/-34] has a large error bar and actually encompasses our prediction  and others as well, so can in itself not be used as a discriminator. There are several predictions in the 50-80 range. One could write a whole monograph on the issues raised and they touch upon many aspects of solar activity causes, so this short note can’t do justice to the papers. Leif, do you have any objection to the following claim? 2) the fact that the variation for the minimum 1944 does not show the usual ‘peaked’ structure of every odd-even cycle peak ever since. Note that there is a strong suggestion of contamination of the 10Be record by aerosols from volcanoes. About the wavelets: as it is not clear how much of the 10Be record is really due to the Sun, it is not clear what the significance of the 150-year signal and the 2300-year signal are, so speculation can have an [almost] free reign. I do not, personally, consider these periods established [as the Scottish say: ‘not proven’]. Ah, you are right. Ken usually works with 10Be so I had a small senior moment there. The Carbon cycle is even more problematic than the 10Be cycle. Yes, there such well-known issues [even touched upon by Mayaud himself], e.g. the K=0 bin [for disturbances less than 5 nT] should not be assigned an amplitude of 2.5 [or even worse: 2 for the aa-index], as there are many more cases within that bin where the disturbance is greater than 2.5 than less than 2.5. The ‘effective’ amplitude weighted with the frequency of occurrence is more like 3.75. Thank you for the crash-course on issues with geomagnetic indices. A final question: Now that we have cleared up the minor misunderstanding about the wavelet plot, can you see any reason to dismiss-out-of-hand the notion of a ~150 year cycle? There are few things I dismiss out of hand [some might disagree 🙂 ], but for something to be interesting to me I have to put it in context with something else or connect it with another phenomenon. since I don’t know where to place the 150-year cycle [if even real – which I’m not convinced of] I would tend to ignore it until such time that a context becomes apparent. And, BTW, thanks for taking the trouble of trying to understand some of these very arcane issues with indices. Few people do. Leif, if you can somehow find time to write a summary of issues with geomagnetic indices, going all the way back to the beginning, with a play-by-play of all of the classic developments, I believe many will appreciate it, particularly those pursuing interdisciplinary research on a limited time-budget. Thank you for your dedication to this field. I am interested to see where this discussion goes next. This session of invited talks will trace the history of the study of earth’s magnetism including: Gilbert’s De Magnete, early studies of geomagnetic activity by Graham and Celsius, Gauss and Weber’s Magnetic Union, Sabine’s British Colonial Observatories, establishment of the solar-terrestrial connection, Bartels’ development of geomagnetic indices, and the modern Intermagnet and space borne observation programs. Contributed talks will be given in an associated poster session. Proposals are encouraged that take advantage of this opportunity with studies of domains ranging from the center of the Sun through terrestrial and planetary space environments to the boundary of the heliosphere. High priority will be given to studies addressing the interaction between various regimes. Taking maximum advantage of this opportunity will require interaction between specialists in different regimes. I wonder if this means Gerhard Lobert’s ideas are disqualified (since he appears to be looking beyond “the boundary of the heliosphere”)? It would be great to hear from some physicists on these ideas. I look forward to frank comments from anyone qualified to assess these provocative claims. Last year I wrote a white paper for my company titled, “The Threat of Space Weather to Mission Critical Facilities”. The paper discusses the increased possibility of geomagnetically induced currents, satellite damage due to atmospheric drag and increased incidence (and intensity) of terrestrial storms due to increased solar activity. I assumed that the predictions of NASA scientists were correct and that we were headed for “a doozy” of a solar maximum. You lot seem to have figured out early that the Solar Max of cycle 24 was not going to play out as some expected. I am concerned that I may have made other erroneous (or potentially erroneous) assumptions in my paper. If any of you would care to read the paper and offer criticisms I would greatly appreciate it.